This fine New York beat ballad has been a favourite of mine for many years now due to Fisher's powerful and "in your face" vocal and the high quality of the song and it's arrangement. 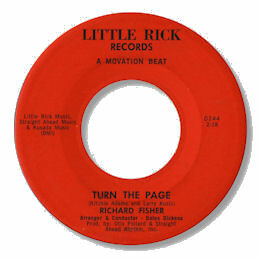 Turn The Page is his only solo release but he did record aslead vocalist of the Jive Five on Musicor and Decca in the late 60s and early 70s. It's his voice on their magnificent deep ballad "No More Tears". Now this 45 was released around 1983 but I simply don't believe it was cut that late in the day. Producer/label owner Otis Pollard - who manged the Jive Five - must have had it in the can for a considerable time, back to the mid 60s at least. The other great Little Rick 45 "Count Your Blessings" by Little Hooks & The Kings came out in 1963. I like very much t way the ballad side of this single is inscribed "A Motivation Side" - which would not have happened in the 60s - while the uptempo flip, a version of Ivory Joe Hunter's classic "Since I Met You Baby" is inscribed "A Double Drive Beat". UPDATE ~ John "Soul" Smith has very kindly been in touch with some more details of Richard Fisher's life and career. John writes that Richard was "born around 1942 in Bessemer, Alabama. During high school Richard sang in several different groups with his friend 'Bill Spoon'.The two guys lost contact when the Fisher family (Richard & Jesse + parents ) moved to Cleveland Ohio. Not long after, the Weatherspoon family also moved up to Cleveland. In early 1960, after his family had settled in Cleveland, Bill (William Bell) reunited with Richard and they formed a street corner group whose members included David Peoples and Walter “Ricki” Dannison (Ricki Sonda). The group never had a real name but they enjoyed singing on various street corners in the Kinsman area of Cleveland. Bill was drafted and lost touch with Richard. Richard followed a career path in the music biz & ended up being recruited to join the Jive Five down in the New York area. Bill returned to Cleveland & also got into the music biz as a member of the Soul Notes. David Peoples recorded for Bobby Massey & then went on to be lead singer with Jimmy Landers & his All Stars. Ricki Dannison also got into the music biz & in the 80's, he & Bill Spoon statred a music production company in Cleveland. Richard Fisher passed away many years ago at a relatively early age." I'm very grateful to John for sharing this info.